A book which I earmarked to read for some time. Finally, I did. This heartbreaking story of a woman’s life journey in early 19th century Iceland gripped me from page one. 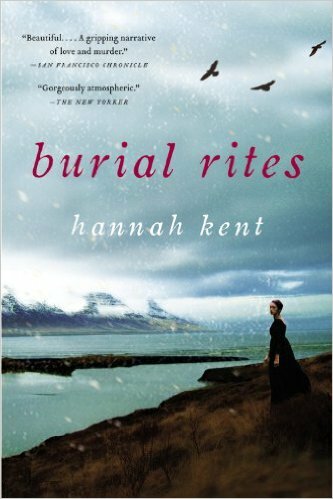 Burial Rites is a fictionalised story of a true event – In 1828, an Icelandic servant named Agnes Magnúsdóttir was convicted of killing her employer and another man, then burning their bodies. Hannah Kent’s take, as she explained, was “to supply a more ambiguous portrayal” of a woman who has been seen as a “witch, stirring up murder”. There is no happy ending, and it is no surprise. But this book is not about finding out what happens at the end, but a study of Anna Magnúsdóttir’s life leading to her execution. The Icelandic setting of unrelenting cold and unforgiving rocky terrain, is perfect backdrop to this story of poverty and a woman’s place within it. A young girl growing up without love and care, spurned and betrayed by those she depended on, Anna’s shame is writ large in her name, and by all that followed her survival. There was no prison in Iceland then. So when Anna was convicted of murder, she is sent to live with District Officer Jon Jonsson; his ailing wife, Margret; and their two daughters to await her execution. A young clergy, Assistant Reverend Thorvardur Jonsson (‘Toti’) is sent to Anna as a spiritual guide to prepare her for the fateful day. Reverend Toti initially did not understand the story Anna told, listening through his naïve and blinkered view of the world. But he finally did. And as Anna’s story unfolds, I the reader am confronted by questions. What makes a person culpable for her actions? What does it mean to undertake voluntary act? Who is responsible? How much of our stories are constructed by what was told about us? How much of us is truly seen and understood? A solid account. An engaging story. Highly recommended.